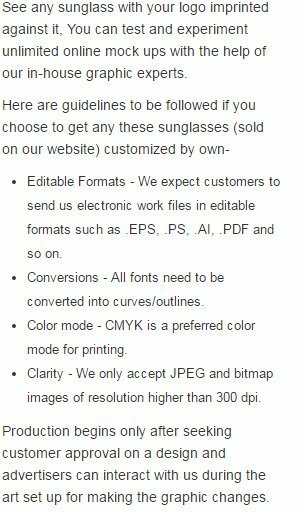 Custom printed kids classic neon sunglasses are great for marketers who are trying to attract kids to their business. With neon sunglasses being the current trend, marketers can easily rely on these for wooing their young customers. These customized neon sunglasses are offered in assorted neon colors and you can easily choose the one, which might appease your young customers. Perfect for hotels, beach side accommodations and more operating near beaches. Save on UPS ground shipping within the contiguous USA. Request a quote to know discounts on bulk orders of these customized kids classic neon sunglasses. Imprint Area : 1 1/2" X 1/4"